As you travel across the city of Altrincham, you will stumble across this ice skating rink. So, if you are a speed demon, dancer and fun-loving person, then it is the perfect place for you to be in. You can enjoy your time with your kid in the special parent and toddler section where there are bonus features like ice cars, ice bikes etc. With its friendly atmosphere and popular location, this rink is turning out to be a popular location for the younger generation. You can even participate in ice hockey and ice dancing at affordable prices. Find the joy in planning a D.I.Y. trip by using this awesome Altrincham trip planner. Book perfect hotels in Altrincham like Mercure Altrincham Bowdon Hotel, Holiday Inn Express Manchester Airport and Etrop Grange Hotel. Explore the best Altrincham vacation packages that will take to you important landmarks of the city! For getting in, check out how to reach Altrincham. Love this? Explore the entire list of places to visit in Altrincham before you plan your trip. Fancy a good night's sleep after a tiring day? Check out where to stay in Altrincham and book an accommodation of your choice. Great place for some family fun- my daughter's enjoy it so much and the staff are very friendly! This was a pleasant place to visit A fairly new building which is tidy and well maintained. We watched an ice hockey match against the local ice hockey team Manchester Storm. This is a small friendly rink and not over commercialised The food and prices were reasonable for the usual drinks, burgers etc plus bars. There is a free well lit car park outside but you need to get there early to get a space. Quite a pleasant experience. The ice rink is OK. It's a bit dark and dingy and battered. 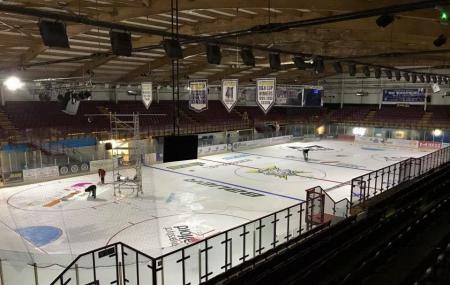 The ice needed resurfacing at 11.30 am when I arrived, which was only a hour after opening. It cost £35 for 1 adult and 2 children (5 and 9) including skate hire, which I thought was a bit steep. The skates weren't the best and the straps kept popping open. This was all about a 3 star experience, but what makes me drop it to a 2 is the policy with the penguin aids. Having spent an additional £10 for 2 for my children, I learned that this is only for 1 hour. The staff were very vigilant about this too and I was politely asked to return them when we overran on our time. The problem was then that I had 2 children who couldn't skate and only one of me to support them. It took us another 20 minutes (with plenty of tears from my daughter) to do another circuit, clinging to the edge before we gave up and handed our boots back as I wasn't prepared to fork out another £10. Adding on the £3 I paid for parking, our 1 hour and 20 mins in there (including a 20 min refreshment break) came to £48 - not good value for money in my view. Next time we will go to Sheffield, which is only a few miles further away for us. The experience of the rink is only marginally better there and the prices are similar, but the children were allowed to keep their penguin as long as they wanted for £10 so we got a whole day out of it, not just an hour. So fun in ice skating,my children like ice skating. The ice rink is a great facility to have here in Altrincham. Wonderful atmosphere watching Manchester Storm- recommend to anyone to give it a go!